Hey guys, we're after making the canoe club calendar publicly available! 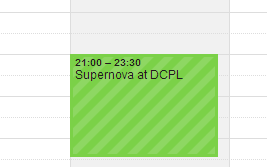 You can add it to your UCD Timetable so that you never miss a thing! Log in to your UCD Connect account. 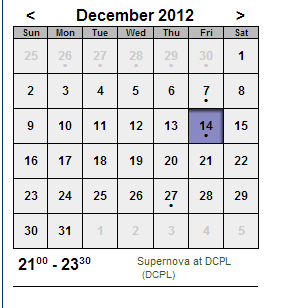 Click on "Add by URL"
You should see a "Supernova at DCPL" fixture scheduled for tonight (Friday 14th Dec). Go back to your UCD Connect homepage and click "Configure viewable calendars" just above the calendar that's displayed. 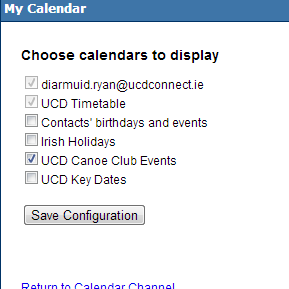 Tick the box beside "UCDCC Canoe Club Events" and click "Save Configuration". 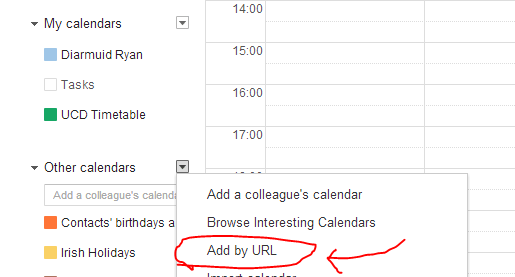 Click "Return to calendar channel"
Amazing ! Good work Diarmuid ! How can one person be so clever and handsome all at the same time? How can one person find so many ways to never study? next question is how does one link this calendar with an ipad anyone know? i think if you link it with your account it'll load on your next sync, give it a minute! Cheers for the calender info. Contender for quote of the year too! If it wasn't for this, I wouldn't have known that we're going out next Tuesday and have a gear talk ! This is still updated regularly (thanks Diarmuid) and has all the club related stuff in it like polo, when lunch is on and pretty much every other event.